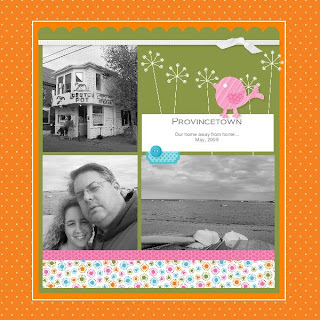 So I finally had a little time to play with my new My Digital Software from Stampin' Up. 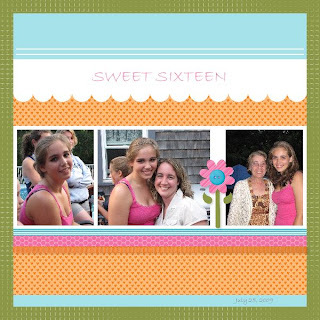 I created these three scrapbook pages and the card using the templates provided in the program. It literally took me less than a half-hour to make these. You just drag and drop your photos into the templates. As for the card, I used a template to start and then "doctored" it up a bit. I could probably fiddle and play with these for hours, but I wanted to show how quickly these pages could come together. And if I spent two hours fiddling with one, well, that really wouldn't help my point any! I think these came out super cute for my first attempt. And I must tell you, I've had very little training with this program. Not that Stampin' Up doesn't provide us with plenty of info about the new My Digital Studio software, I'm just one of those gals that wants to dive right in ( I hate reading directions)! I do plan on watching all the video trainings we have on the program and becoming a certifed instructor, so rest assured the pages and projects will get much more impressive as we move along! The great part about this program is that it offers all of Stampin' Up's signature colors (including some beloved retired "In Colors") and it provides many of my favorite stamps, embellishments and punches, too. And there will be additional downloads available for those who purchase the software and want to add to their resources. With the start of software, you receive over 2,000 images when you include the stamps, punches, and designer series paper! Pretty simple... but as I said, this was just a first attempt -- and all of it was done in less than 30 minutes! Imagine how quickly you could get caught up on your scrapbooking! Now, I don't see myself giving up on traditional scrapbooking in any way, but this will be great to reduce some of the backlog, don't you think? Plus, it also provides great opportunity for "hybrid" projects as everything is "true-to-size" - meaning the stamps and embellishments are the same size as our actual stamps and embellishemnts. So if you have it printed through our printer (which will also ensure color accuracy) you could stamp that cute little skater couple on cardstock, cut them out and layer them on top of the printed version of your card to add dimension. 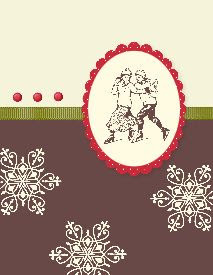 Or add the brads to the card after it is printed for a little 3-D effect... lots of opportunities with this product. Feel free to call or email me if you have any questions and check out my website if you want to learn more or place an order.